The simit (savory sesame ring) is perhaps Turkey’s quintessential street food, and it has been so for over 500 years. It is sold in many spots throughout Turkey’s major cities and in bakeries in smaller towns. Turks of all ages eat it at breakfast, on a ferry boat ride accompanied by a glass of tea, as an afternoon snack, and whenever else hunger sets in. In today’s Istanbul, 300 bakeries supply simit to the city’s inhabitants. Control of these bakeries changed hands many times during the 20th century; the Greeks owned them in the 1940s, and families from Safranbolu and Kastamonu in the Black Sea region took over from 1950 to1960. In the mid-1960s these bakeries offered young men who had migrated to Istanbul in search of a better life a warm place to sleep. With a roof over their heads, the young men, mostly from Tokat in the central Black Sea region, started their new lives in the big city as simit sellers. Over time, they took control of the establishments they once worked for; today families from Tokat own 85 percent of the simit bakeries in Istanbul. 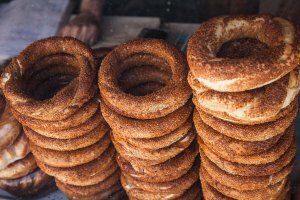 They bake simit, and its twisted cousin catma, from 10 pm to noon the next day, sometimes churning out one thousand, three thousand or five thousand simit per day, depending on the season and demand. In a traditional simit bakery, men work around a counter stretched in front of a large wood-burning oven. A 50-kilo (110 pound) sack of flour, 16 liters (4 gallons) of water, and one package of yeast are mixed. Large machines knead the dough, and the first man cuts it into pieces weighing each one. Next, two men roll out the dough into rope-like strips that are twisted and joined to form a ring. They fling the rings into a vat of pekmez (molasses). This step of the process gives the simit its distinctive caramelized color and slightly sweet taste. Each bakery has its own form of molasses. Some will use grape molasses, others make a simple sugar-water; some boil the molasses, while others keep it cool. After the molasses bath, the rings are removed and receive a generous coating of sesame seeds. There are no artificial flavors or ingredients used throughout the process. Finally, the last man places the coated rings one after another on a long wooden paddle and pushes it into the wood burning taş fırın (oven). The kürekci (paddle master) is the most critical person in the entire process. He must know exactly where to place the simit within the large oven. If they are placed too close to the fire they will burn. Legend has it the rings must bake until they turn the color of the 22-karat gold coins the Ottomans used. Today, the shouting sellers that roamed the streets decades ago, have all but disappeared. Instead, wholesalers arrive at the bakeries to distribute simit between 6 and 9:30 am and again between 4 and 6 pm. to the street sellers, who are at designated points throughout the city with clean, glass-enclosed carts. Some of the carts have lights and awnings, and may have a sign designating which bakery provided the simit. As the carts are replenished, the sellers will yell, “Taze, yeni geldi, Çıtır!” (Fresh and new, Crispy!) and not before long, only a few simit will be left. Over 2.5 million of the sesame rings are sold daily. 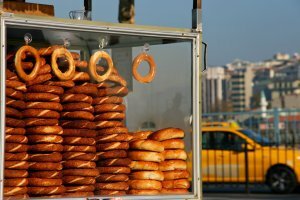 After the Turkish economic crisis in 2001, multi-storied simit “houses” sprung up across Istanbul, sometimes taking over abandoned bank branches in the central parts of the city. For two liras (approximately one dollar), they offered simit and tea, an attractive alternative to McDonald’s eight-lira meal. Morning, afternoon, night, and into the wee hours, people could eat simit and drink tea in these glitzy places. The simit palaces also started making different varieties of simit, filled with kaşar cheese, sucuk (sausage) or zeytin (olives). However, the simit from these ‘fast-food joints’ do not compare to the taste of the traditional street simit. As the word simit derives from ‘ring of flour’ there are variations throughout Anatolia, including those without sesame seeds (sometimes called gevrek) , the twisted version çatma, and the smaller rings (kandil simit) that are made during the Muslim holy nights of kandil.